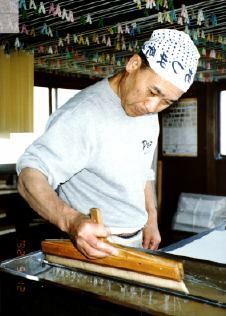 For our 'Craftsman of the Month' this time, we're going to drop in on the man who coats my printing paper with 'size', a necessary step before I can use it for my printing work, and we'll also have a bit of a change, and hear about somebody else's Hyaku-nin Isshu Series. We didn't need the fax machine to do the newsletter translations this time, as Michiyo is now back here in Japan for a few months for her summer holiday from university (a working holiday!). You can be sure that we're all enjoying our time together, and perhaps my carving shows the effects of my slightly less hectic schedule. At least I hope it does! The contact with Matsuzaki-san had opened my eyes to a whole new way of doing things, and my focus now turned to improving my printing. I made trial after trial of printings from the Tenji Tenno blocks. I had previously been using watercolour pigments from tubes, but I now obtained a small collection of 'ganryo' pigments - the same ones used by Nihonga painters, and started to learn how to use them. It was a bit of a shock to me to learn that the colours used by printmakers did not just 'come from the tube', but were all created from scratch by the printer himself. Of course, everybody knows that 'blue + yellow = green', but I had no idea of the incredible things that could be done with basic colours. With only a very small collection of these basic pigments, Matsuzaki-san is able to create an exquisitely subtle array of colours in his prints. Michiyo shook her head in amazement as she discovered the depth of my ignorance. 'Didn't you learn any of this stuff in school?' Well, I guess I wasn't listening! (I have since found out that here in Japan, every Elementary school student in the country learns quite a bit about colour mixing ... as well as how to read music, how to make a wood block print, how to swim, how to clean their classroom, a bit of this, a bit of that, and yes, even a little bit about the 3 R's). This concept of 'printer as artist' was a revelation to me. I had always understood that woodblock printers were simply following instructions from the artists/designers, but I now learned that in many cases, the designers simply handed over the line drawings, and gave only very sketchy instructions on colouring, if any at all. The beautiful ukiyo-e colours were to a large extent created by the nameless printers. I was a bit frustrated in my attempts to practice my newly developing skills. I had a very full schedule of English teaching, and my refusal to use textbooks in my classes entailed a lot of advance preparation time. In addition to this, I did hundreds of pages of re-writing every week for Michiyo's medical translations. But I knew that this printmaking project held the possibility to transform our life, and I kept moving forward. When the 20 sample cloth cases that I had ordered finally came, I carved and printed labels for them, then made a stack of washi folders (also with hand printed labels) to contain each print. I took the best copies of the Tenji Tenno print (translation: most recent), wrapped them up, and there I was - ready to go. I set aside two packages for my own collection (I have two kids and don't want trouble down the line), gave one to the Sakazaki family as a thank you for them getting me started on all this, and then sat and thought about ways of turning this 'hobby' into a livelihood. I also made a difficult decision - to shut off all new enrollment in our language classes. With the end of the school term that March, a number of our students had left us (passed entrance exams, etc.) and we would normally have been accepting a new influx. But how could I promise these new students that I would dutifully teach them over a period of years, when at the same time I was planning to stop teaching altogether as soon as I could get the printmaking rolling? I couldn't, and we thus stopped accepting any new students, with the result that our income started an inexorable month by month decline, as students left but were not replaced. Could I get to the point of making a living at printmaking before the English income disappeared? It was a gamble, but I felt that I had no choice. He started just about 17 years ago, and has now completed the music for 53 of the songs. As he talked about his work to me he described the compositions as being a kind of 'omiai' (an arranged marriage), between his music and the words of each poem. He writes the songs in a 'duet' style, with varied accompaniments, and the male and female voices on the cassette he gave me weave in and out of the melodies, always cooperating - never competing. Not for him a melodramatic operatic style of duet. As he puts it, "For me, it's the song that's important, not the singing." He says that the early days of the project went quite smoothly and quickly, but that recently it has become more difficult. I have no doubt that he will be able to finish his series, but perhaps he regrets starting off with those poems that seemed easiest to match with music. But he is much more experienced now, and one by one, slowly but surely, the songs come out from under his fingers. 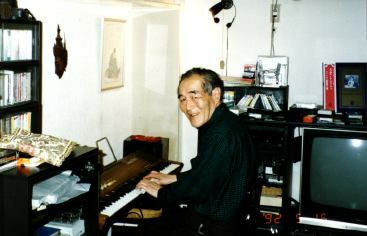 There are occasional performances of his music, including a large concert in Osaka last year, involving solo singers, accompanists, rock group, and chorus. Crocodile skin! I couldn't believe my ears. I knew that shark skin is used in printmaking, but this was the first I'd ever heard of crocodile skin (wani kawa) being utilized by traditional printmakers. A hundred questions instantly bubbled up in my mind. How on earth did the Edo craftsmen ever get hold of such a product? What will my collectors think when they find out about this? Why had I not heard of this before? Misawa-san saw the obvious confusion on my face. He patiently started to explain again what ingredients were in the liquid sizing that he was brushing onto each sheet of paper. 'Myoban' (alum) I understood. But 'wani kawa'...? And then the penny dropped. Not wani kawa, crocodile skin, but wa nikawa, Japanese glue. What a relief! Everybody pretty much understands that my prints are made on Japanese hand-made paper ('washi'), but what is not so well-known is that it must be processed a bit before I can use it for my work. After the Yamaguchi family has finished making the paper to my specifications, they send it to Mr. Isami Misawa, who 'sizes' the sheets one by one with a glue-like mixture, and gives them the strength to stand up to the repeated rubbing with the printing baren. One day this spring, I made the trip over to his workshop in south-eastern Saitama to get better acquainted, and to see something of how the work is done. The drying proceeds at a natural pace. He never exposes the sheets to the sunshine, as papermakers sometimes do, as this would result in a too rapid drying, and a resulting weakness in the sized sheet. Misawa-san mentally gauges the humidity, and adjusts the window openings to suit. The rainy season is of course a major headache. The size can easily start to decay if left wet too long, as nikawa is made from animal bones, (it is quite similar to the 'hide' glue used by violin and guitar makers). As we sit chatting later I learn that his work even has an effect on his diet. If there were traces of oil on the paper, the size would not penetrate properly, and the colours in the finished print would be uneven. In order that the sheets of paper are protected from even the tiniest traces of skin oils from their hands, Misawa-san and his wife eat no tempura. A Japanese kitchen without fried foods! There are quite a number of different costs involved for each of the finished prints that I send out: washi 500+yen, packaging 300yen, part-time helpers 500yen, postage 500+yen, woodblocks 200+yen (per sheet), etc. Among all of these, by far and away the smallest is the fee Misawa-san charges for his work: \60 per sheet. He himself refers to his part as 'ichiban shita', the 'lowest' part of the process. But I cannot carve without smooth woodblocks or without a good blade. I cannot print without a good baren, good washi, or without good sizing. Who among these craftsmen is to be 'ichiban shita'? I am sure you can guess my answer. I was astonished to learn from Misawa-san that he has never met Yamaguchi-san the papermaker. Decades of work together, and yet all he knows of Yamaguchi-san is what he read in this 'Hyaku-nin Issho' newsletter a few months ago. As soon as I can afford to do it, perhaps for the 'half way' exhibition in January of 1994, I want to bring all these craftsmen together (the men you have read about in this newsletter, as well as the ones who have yet to appear in these pages). I want to stand side by side with them in front of my prints, and I want to show everybody in this country just what a woodblock print really is. It is not Shunsho, or Utamaro, or Hiroshige. It is a craftsman, his mind at rest but his full attention focussed on the work before him, the sheets of paper (or twists of bamboo, or slugs of steel) coming into his hands in a steady confident rhythm, being worked on, and then being passed on to the next man, and the next, and the next. And then finally passing to you, the collector. After I made my farewell, and walked up the road toward the bus stop, I knew that Misawa-san was probably already back upstairs at his bench, trying to make up for some of the working time he had lost talking to me. But I also knew that no matter how late he became, the rhythm would not vary. Each sheet would still get the attention it needed. The sizing would be done properly. As you hold your next new print to inspect it, spend a minute and think of Misawa-san and his vat of 'crocodile skin' soup. The size he applied to that sheet was actually only needed for the short time that the paper was on my printing bench, and it will gradually disappear from the paper over the course of the next few decades. But without it, and without his skill, your print could not exist. 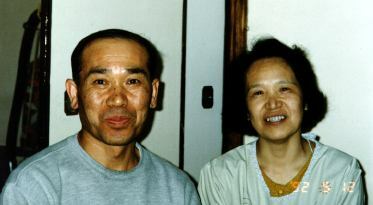 Mr. and Mrs. Misawa, thank you very much. A small 'kanban' hangs at the entrance to my workshop. The lettering on it reads 'Tokyo moku hanga kogei kumiai in', and it identifies me as a member of the Tokyo Association of Woodblock Printmaking Craftsmen. I have been part of this group since the spring of last year. I had been attending some of their get-togethers for a couple of years previously, and when the suggestion was made that I join, I quietly became the newest member of the group. As the name of the group implies, the membership is made up of craftsmen working in the old style of printmaking, where the work is divided among different people. There are a dozen or so carvers (who never print), and a somewhat larger number of printers (who never carve). In addition to this are the 'supporting' workers, people like Shimano-san the block planer and Misawa-san the paper sizer. Needless to say, new members are somewhat of a rarity. The group has been shrinking in size for many years now, as young apprentices are few and far between, and as I look around the room during a meeting, I feel really young again! (Actually, I am not the youngest member. I think perhaps that honour goes to Matsuzaki-san's son Hiroshige, who is in his twenties). Most of the kumiai members can trace their working 'lineage' back many generations. They are very conscious of the men who preceded them, from whom they learned their skills. I am sure that back in the old days, there was perhaps quite a bit of 'competition' between craftsmen from different lines, and perhaps not a few secret techniques were jealously guarded, but I don't think that there's much of that sort of thing left now. It was to make contact with just this group of men that I came to Japan some six years ago. I feel a bit ashamed at how little time I have actually spent with any of them since then. It's not just that I've been occupied making a living, but that these people all have work to do, and although they are willing to help me out on occasion, they don't want to be disturbed too frequently. This is especially true of the carvers. I know from my own experience that visitors to the workshop can sometimes disturb one's concentration, and this is one reason I do most of my more delicate carving at night, but it is sometimes quite frustrating to be 'so near, yet so far' from their workbenches.